Can I limit how many of a specific product my shoppers can purchase? In some cases, you may have a limited amount of product available and you need to set a limit on how many of that product your customers can order at one time. For example, you may have a high demand item and need to limit it so each customer is only able to purchase a maximum amount of 2 per order. 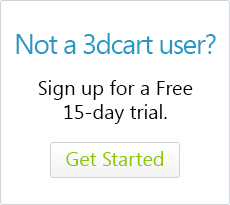 With 3dcart, you can set a cap for the maximum amount of a product each customer can purchase per order. Go to Products and search for the product that you'd like to edit. Clicon the product's name (or look to the far right and click on its "Action ->Edit" button). Next, click on the Advanced Tab. Type the maximum amount of the product you would like each customer to be able to purchase in the Max Qty. field. Once set, your customers will only be able to order that maximum amount on their specific order. To process an additional amount, the customer would need to re-order the item. The purpose of adding this limit is to give all of your customers a fair chance to order a high demand product.